An easy, one-pan breakfast hash recipe made with sweet potatoes, onions, sausage and eggs that's easily scalable for one person, a family or a large group. 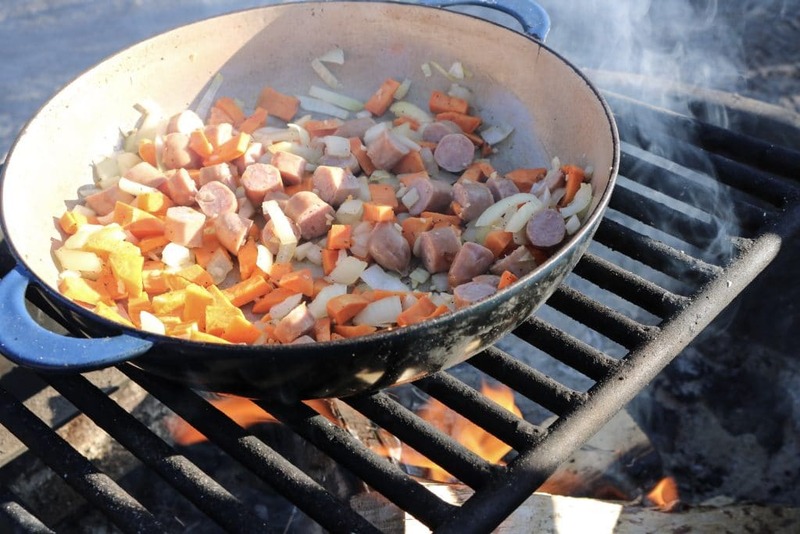 When I am camping I usually like to use as few pots and pans as possible while still having a hearty meal that will help carry me through a days worth of adventures. This Sweet Potato Breakfast Hash recipe packs a hearty punch and is easily scalable for one or for a large group. It can also be cooked in a cast iron skillet or on a Skottle. 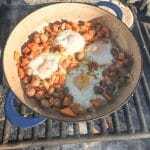 An easy, one-pan breakfast hash with cubed sweet potatoes, onions, sausage and eggs. Heat the pan on a medium-high heat with both the butter and oil. Be careful not to burn the butter and oil by placing the pan too close to the fire. Cube the sweet potato into pieces the size of your fingertip and add to the pan once butter has melted. Cover the potatoes and cook for about 5-7 minutes while stirring occasionally to keep the potatoes from burning. After 5-7 minutes, add the onions, jalapeno, garlic, and continue to cook while covered. After an additional 5-7 minutes, add the cubed sausage. Cook the mixture uncovered while stirring occasionally for 10 minutes or until potatoes are soft. Once the potatoes are soft, crack the eggs on top of the hash and cover the pan. Cook the eggs covered for roughly 5 minutes or until desired. Add salt and pepper to taste. Remove pan from heat and serve! Tip: Niman Ranch Apple Cinnamon Uncured Breakfast Sausage (sold at Sprouts) is a great option for the sausage. It's fully cooked, super tasty and you can use half for this recipe and heat the other half up on the grill to serve with Camp Site Cinnamon Rolls.